Whip shake with two ice cubes and double strain into a rocks glass filled with crushed ice. Garnish with a berries (here, blackberry and raspberry), orange slice, and mint. 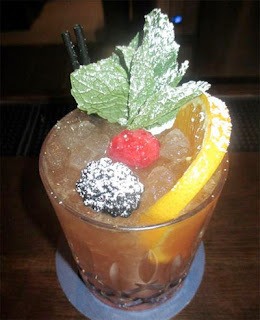 Add straws, and finish the drink by sifting powdered sugar over the garnishes. Probably the most stunning visual cocktail of my New Orleans adventure -- with, of course, Beachbum Berry's Tiki libations in a separate class of their own -- was this Cobbler at Compère Lapin. The taste also lived up to the appearance as well. For dinner on Sunday, I stopped into Compère Lapin and asked bartender Ricky Gomez for this drink. Since the drink description said "rum," I asked which one expecting it to be Myer's (yes, mentally overlooking the spelling difference). Ricky declared that it was El Dorado 5 Year Rum, and when I inquired further about the name, he explained that the Cobbler drink shares a linguistic relationship to the Cobbler shoemaker, and that got him thinking about old-timey professions. Therefore, he paid tribute to Meyer the Hatter on St. Charles Street, a shop founded in 1894 that I passed by every day on my way to the Monteleone Hotel. 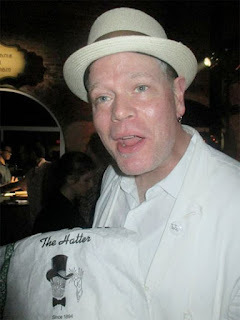 Moreover, it is one of Boston legend John Gertsen's favorite New Orleans stops; when I bumped into him at the Bartender's Breakfast during his brief Tales sojourn, not only was he sporting a new hat, but he was carrying a Meyer's bag with more goodies (see photo below). Once prepared, the Meyer's Cobbler shared an orange and mint aroma that led into an orange and grape sip with a hint of caramel from the rum. The rich rum continued on into the swallow where it blended in with the nutty sherry, and finally the drink ended with a light strawberry note. Figure 1: Portrait of a hat fiend.